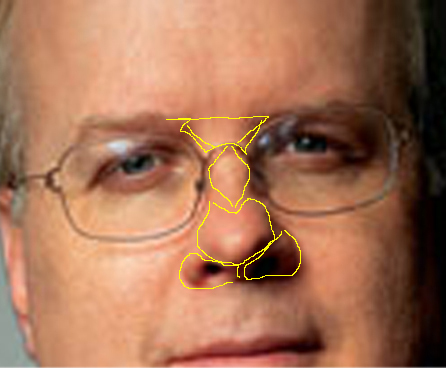 In particular how would you draw Karl Rove's nose? 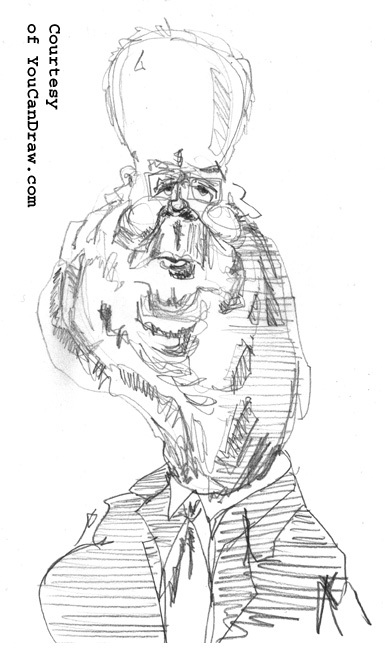 And of course... what's caricaturable about it? First, where does the nose sit? What's around it? In what is it embedded? ( A bunch of trouble?) What do you look for when drawing a nose? Is it really there to support the glasses? Rudder your way through life? Thumb at things? Do you really have to pay through the nose? Yes it's multitalented and multitasking. We covered Karl's eyes in the December issue and I mention that because it's important to put the nose in a context: where does the nose sit in relation to the eyes? First, it's generally a given fact that the eyes are about one eye-width apart. True, it doesn't look that way, but when you get out your rulers, it's actually a good rule of thumb. Why does this space (the one between the eyes), look less than that? I think it's because there isn't a single flat plane, or a single color or a consistent light or shadow area between the eyes. You also get fixed on the relative narrowness of the nose; plus you have all the different contours of the nose going on in there. It breaks up this space into sections: you have the side of the nose in shadow on one side, then you have the spine of the nose where it's in a plane parallel to the rest of the face, then it rolls back down to the side of the face that might be bathed again in light. There's topography going on there. In a word, the space between the eyes is filled by the nose and the transition of going from eye, to nose, and back to eye again. As long as we're going left to right (or right to left), lets drop down to the next horizontal section of the face. (The next horizontal section meaning like at the level of the cheek bones - we started at the level of right-between-the-eyes above.) As you do this you run across the same topography as you move side to side: the nose is popping up and out again. Okay, quick review. 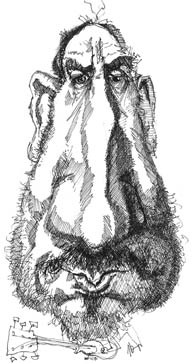 The nose is bounded by the forehead above, by the eyes to the left and right higher up on the face, the cheeks a little further down. 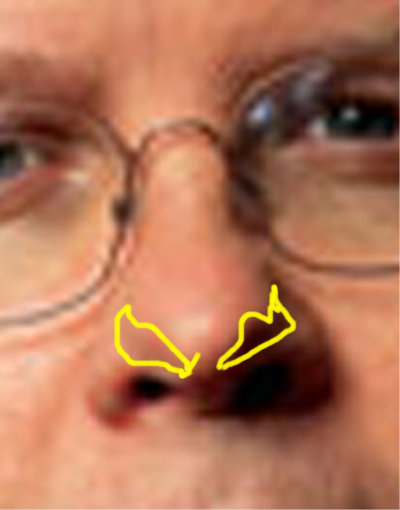 At the lowest part of the nose, it's bounded by the apron of the upper lip. Squint your eyes and you'll see the way light and dark (i.e. shadow and light), lines, edges, fits together like a jigsaw puzzle - all that stuff I've gone on about to ridiculous levels in the book. Not super clear? Keep reading. So what's notable about his nose? Compare these two gentlemen. Ask yourself this: "In which is the bottom of the nose closer to the level of the eyes? In which is the bottom of the nose closer to the line made where the upper and lower lips touch?" How does the width of Mr. Rove's nose compare to say Jazz great Thelonius Monk? 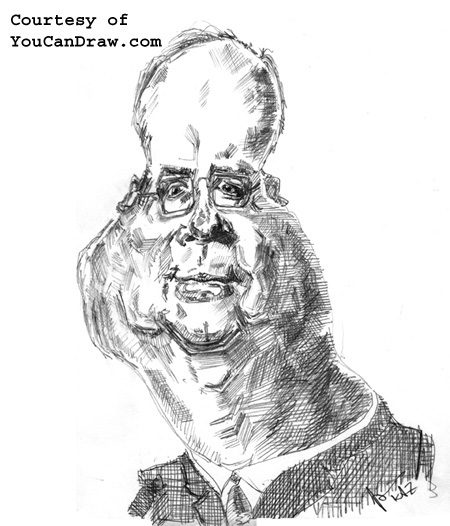 Check out this next caricature...and why is Mr. Monk giving Mr. Rove such a look of discernment? The yellow lines are there to demonstrate the approximate distance between these three landmarks (want to see a whole ton more about the horizontal landmarks of the face? See the free Janet Jackson Flash lesson, and this section in the Ani Difranco in-depth lesson) . Now scroll back up to the picture of Mr. Townsend and imagine the same three lines drawn on his face. 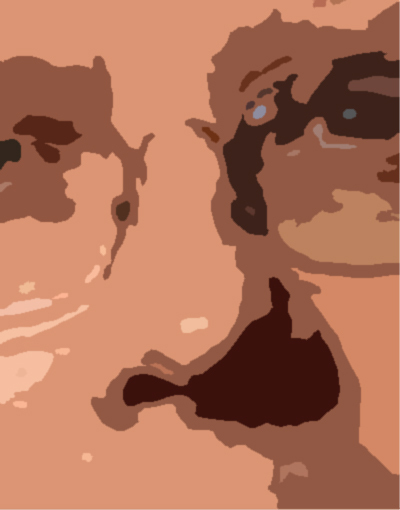 Which line is the bottom of the nose closer to: the line drawn through the middle of the eyes or closer to the line drawn between the lips? If you were doing a Laurel and Hardy type double caricature (that is two faces drawn in the same picture) does it become obvious how you could play the exaggerations of each off each other? Of course, if you don't have a Pete Townsend in every picture to play your subject off against, you need some kind of internalized or benchmarked standard of comparison. Mr. Average is that guy until you start getting a feel for judging subtle differences in anatomy. Alright. So far we've very quickly discussed some of the anatomy surrounding the nose and we've talked a little about drawing / visualizing horizontal lines as an aid to help you visualize proportions between the eyes. 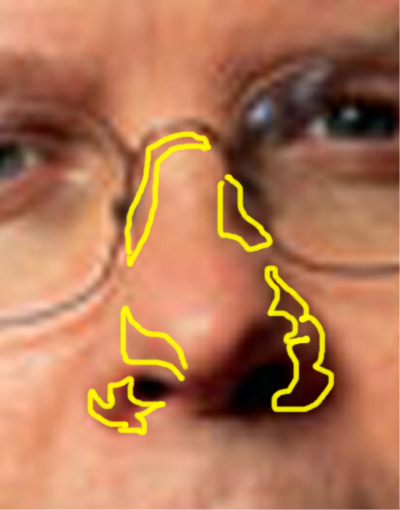 Now, right quick, we'll look at the anatomy of Sir Karl's nose itself. Now to the nitty gritty. I'm not going to point out the wedges of the nose i.e. 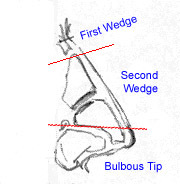 the specific anatomy again, but I still want you to look for these shapes within the nose as we look at the nose in terms of highlight and shadow shapes. 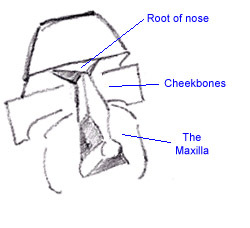 The root of the nose (where the nose arises out of the forehead), which is also the first wedge is thick, somewhat broad. It fits together with the middle wedge of the nose about where the bridge of the glasses are. 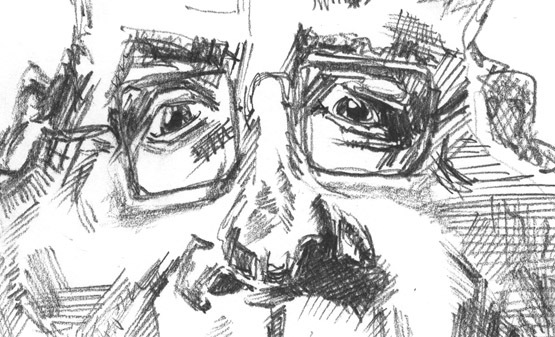 The bottom of the bulbous tip doesn't come down a whole bunch farther than the bottom rim of the glasses, and the nostrils / base of the nose are distinctly separate from the bulbous tip. And now, on to the darkest shadows. I've outlined them again in Photoshop. Scroll between all these pictures until you can look back at an un-outlined photo of Karl and and see these different areas of tone (which represent shape) for yourself. Ok, I've thrown a lot at you here. Gotten pretty tedious actually. You really need a pretty good understanding of all the fundamentals of drawing to make today's lesson make sense. (Course, you can find all the fundamentals in the sourcebook :-). If it made sense, awesome. 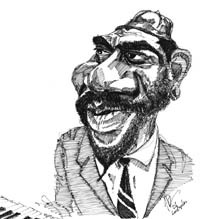 If it did not, here's the challenge: to caricature (or draw realistically), anyone's nose, you've got to learn to see it (or any part of anatomy) in terms of lines, edges, shapes, relationships, perspective/proportion, light, and shadow. That's it. That's everything. I'm a broken record about this. 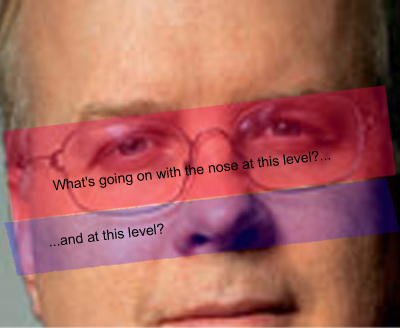 But if you can make even limited sense of those things I just mentioned and learn to see each each section of the nose as representable on paper in those terms, then you can manipulate each part of the nose (and Karl Rove's nose in particular today), because you see each part as pieces of a larger jigsaw puzzle, you understand it. Next month I think we'll leave the nitty gritty alone and do a fresh carciature before we return to more specific details of Mr. Rove. Coo-el!